ClimateCoop is a blockchain based platform for the SDG ecosystem, allowing decentralized collaboration, governance & community development. The platform enables decentralized, self-organizing & semi-autonom community development, project formation, funding and execution in a localized, trustless, legally sound and secure context. The main goal of the platform is to scale, support, speed up and increase efficiency of taking action and managing execution in the SDG domain. ClimateCoop is the winner of the contest “Synergistic Solutions for Sustainable Development” organized by the UN Environment together with MIT ClimateColab. The project will be presented to the UN Environment Assembly in Kenya 2019 (UNEA-4), together with the UN Under-Secretary-General and Executive Director of UN Environment, and will be included in the Global Environment Outlook, the UN Environment’s flagship report on the state of the environment and distributed to decision-makers around the globe. "You can't Change the World and achieve ambitious global goals without (a) systematically changing the funding, governance & collaboration between the independent, autonomous and self-organized parties working towards these goals and (b) scaling the movement to all the societies Around the World developing engaging & proactive communities with strong incentives & clear, granular and tangible contextually customized messages they may act on and (c) having the private sector & super rich encouraged or even gently enforced to transparently pay their fair share of contribution towards supporting A Better World." In 2015, world leaders adopted a set of goals (17 goals, 169 targets), called the Sustainable Development Goals (SDGs) to be accomplished within a 15 years global program to end poverty, protect the planet, and ensure prosperity for all. The SDG domain has to level up its game from its current potential, efficiency, scale of operations & speed as there is a definite urging need for a significant uplift to meet the expectations set. There is a need to disrupt the space to trigger significant change and shift in the approach. Please find out more about The Problem! We are proposing the development of a distributed global self-sustaining Value Network for the SDG Ecosystem that will allow decentralization and localization of climate or other SDG related ventures. The core value creation process of the platform is the lifecycle of turning a great & viable idea, initiative or call for action from wherever or whomever it originates from into a success story via utilizing the contribution, support, resources, funds & competence available within the SDG Ecosystem following certain rules & guidelines and keeping compliance with regulatory policies. The value creation process itself is a generic standard & common process, however it´s realization & supreme existence on top of the ClimateCoop platform, within the blockchain enabled Value Network is what makes it truly innovative & unique. ClimateCoop also allows for a fully transparent decentralization and partial delegation of power, governance, funding & execution of climate related projects to communities, within the directives & supervision set by global and regional NGOs. Please find out more about The Value Proposition! ClimateCoop will be realized as a blockchain based, distributed platform, a global Value Network for the SDG Ecosystem. The following are the key technology & methodology pillars that enable the realization of ClimateCoop. 01 - Decentralization to decompose the sheer complexity & size and allow for the birth of an individualized, customized, multi-actor (global - national - regional - local) management context fitting cultural, geographical & other differences. 02 - Multi dimensional governance (matrix governance via horizontal geographical tree & vertical SDG topics tree) for separation of concerns, efficient management of scope & reach of influence, partial delegation of power, funding & execution. Utilizing liquid democracy for election of boards, voting for decisions, policies, approvals, ratings, etc. Implementing a value network model as the operational, organizational & governance structure for the entire ecosystem. 03 - Public blockchain for a trustless ecosystem, ultimate security & transparency, smart management of infrastructure & related costs and most importantly a legally enforceable context for commitments, agreements made within ClimateCoop. The blockchain infrastructure we will use will be highly energy efficient, eco friendly, having low operation costs by not using any mining techniques within the consensus. Please find out more about The Enabling Technology! The following capabilities requirement list is the clear justification why we actually need blockchain technology to drive the ClimateCoop platform. 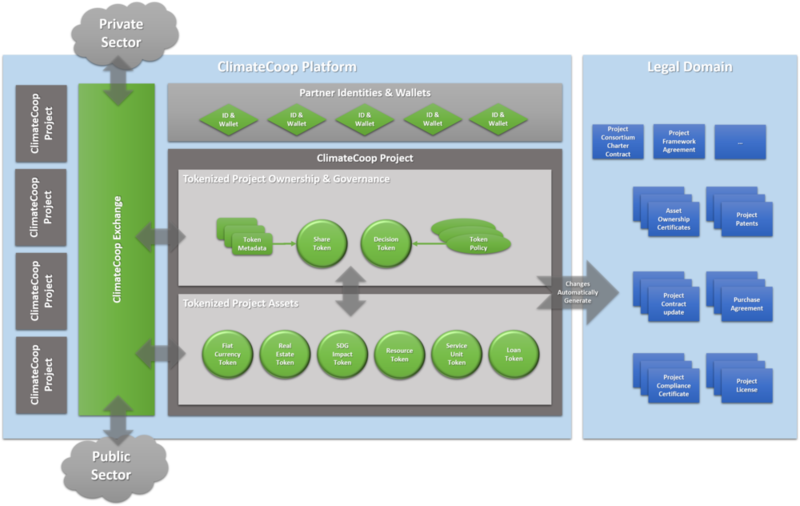 Please go to the "How to Proceed" part and Download the ClimateCoop Vision for a single picture solution overview of ClimateCoop. Multiple rounds of investment needed throughout the journey, but a gradual, step-by-step approach will allow for intelligent way of financing & spending funds. An initial seed investment is necessary to setup a base infrastructure and to finance a pilot implementation. A detailed funding plan can be provided on request, please contact us for this. The ClimateCoop platform will be self-sustainable having all opeartions (OPEX) & future improvement costs (CAPEX) covered via following a treasury model, which is financing itself via making marginal interest from the normal usage of the platform. Note that apart from monetary funds we do look for additionally other value contributions from our partners according to their core competences & characteristics. Please find out more about The Investment! The implementation of ClimateCoop will prepare a generic framework, which however configured & specialized for the SDGs, but will have massive potential for a commercial spin-off. 03 - ONLY FOR profit oriented investors - possible commercial spin-off targeting Fortune 500 organizations & enlightened, modern governments who are willing to reinvent themselves in the era of decentralization and take their level of digitalization one step further. Please find out more about The Business Case! The core team has proven experience in delivering complex solutions on top of blockchain technology and is very much motivated and capable to pull off the technical realization of ClimateCoop but will have to scale with talented resources and have the right partners with their unique value contribution involved to succeed on the challenging journey. Please find out more about The Team! We are a strong team having a great Idea. That´s a good start, but might not be enough to convince some of the potential investors and future partners to sign up for the venture. We have some additional reasoning in this section, but would always suggest having a personal meeting as we believe everything depends on the chemistry and no text may replace the importance & impact of a personal meeting experience. Please find out more Why you should work with Us together! Our ability to execute on the vision of ClimateCoop will highly depend on the partnerships we will be able to establish in 2018 Q2/Q3. As our first roll out country of ClimateCoop is planned to be Germany we have primary focus on initially seeking local partnerships in this Country and global partners around The World. We are interested in partnership with global NGOs, local NGOs, Sustainability Departments of Global Corporations, Institutions of the EU, Government Agencies, Media Outlets, SDG Governance Experts, Technology Partners, Universities & Interns, Experienced Professionals and finally, but not less important Venture Capital Funds, Startup Incubators & Angel Investors. Partners according to their core profile & preferences and depending on their contributions will be legally assured to receive a fair share of tangible & intangible value, interests and benefits from the ClimateCoop venture. We have currently teamed up with the Sustainability Management of the Technical University of Kaiserslautern to research certain SDG topics related to the ClimateCoop platform & ecosystem. Please find out more about Partnerships we are looking for!